1. Utilization of innovative and/or multiple funding sources. 2. Successful regional impact during the most recent 12-month period. 3. Efficient use of public resources and funding sources. 4. Innovative or resourceful cooperation of two or more jurisdictions of government or authority. 5. Transferability of technology, contractual arrangement or management activity. Nominations must be received by close of business on July 1, 2019, to be eligible. The selected project will be announced at the 43rd Annual Governor's Local Issues Conference over August 28 - 30, 2019. For more information, contact Carol Juett at 502-892-3507 or carol.juett@ky.gov. LOUISVILLE, Ky. (August 15, 2018) – The Southern Kentucky Film Commission is the recipient of the 2018 Spirit of Kentucky Award, the Department for Local Government (DLG) announced on Wednesday. 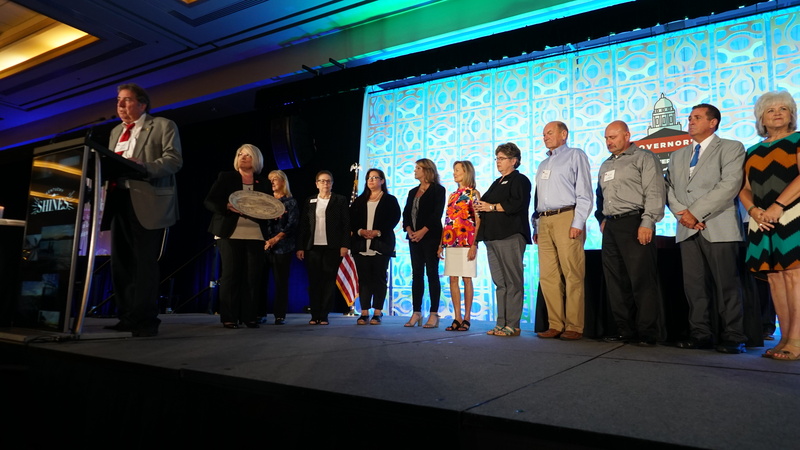 The award, presented during the 43rd annual Governor’s Local Issues Conference in Louisville, is given annually to the sponsors of a public project that strengthens a community through collaboration and thoughtful use of resources, among other criteria. DLG Commissioner Sandra Dunahoo presented the award during the Governor’s Luncheon on the second day of the conference. The winning project represents an innovative and collaborative effort to diversify the economy of seven southern Kentucky counties: Barren, Christian, Cumberland, Edmonson, Hart, Monroe, Warren and Washington counties. Representatives from the counties worked together to attract filmmakers to Southern Kentucky, helping to spur regional economic development. Southern Kentucky Film Commission president Terry Martin, who also serves as judge-executive of Hart County, said Southern Kentucky has what the film industry is looking for: beautiful natural scenery, charming small towns, four temperate seasons, and a workforce with a strong work ethic and willingness to learn. “The whole commission is so excited to have won the Spirit of Kentucky Award,” Martin said. The 43rd Annual Governor’s Local Issues Conference brought together more than 800 attendees, most of them elected officials, public servants and business leaders. Over the course of three days, expert presenters explored issues of importance to local officials and their communities. Nominations for the Spirit of Kentucky award were submitted to DLG for consideration. Projects eligible for nomination include those of government, public service, private non-profit or quasi-governmental groups or agencies. Please submit projects for consideration by July 1, 2019. The award will be presented at the 44th Annual Governor's Local Issues Conference over August 28 - 30, 2019, at the Galt House in Louisville. Is the project active at this time? 1. How does this project demonstrate cost-effective utilization of public resources? Describe the resource savings / conservation which resulted from this project. 2. What are the funding sources of the project? List all funding sources, amounts and percentages of the total project budget. 3. What local issue(s) provided the primary reason for conception of this project? In what way has this project addressed the issue in a creative or innovative way? 4. Describe the impact of this project on the participating communities during the past 12 months. Include discussions of impact on local government fiscal matters, socio-economic conditions of community(ies), and community quality of life. To what extent has there been a positive impact on communities beyond those who have formally participated? 5. In what way is this project especially suited to the communities that have participated to date? Describe how the activities and administration of this project may be duplicated, with similar benefits, by other communities in Kentucky or elsewhere. What major adaptations would likely be required for the project to be duplicated elsewhere? 6. Explain additional considerations why this project should be favorably considered for receipt of the Commissioner's Spirit of Kentucky Award.